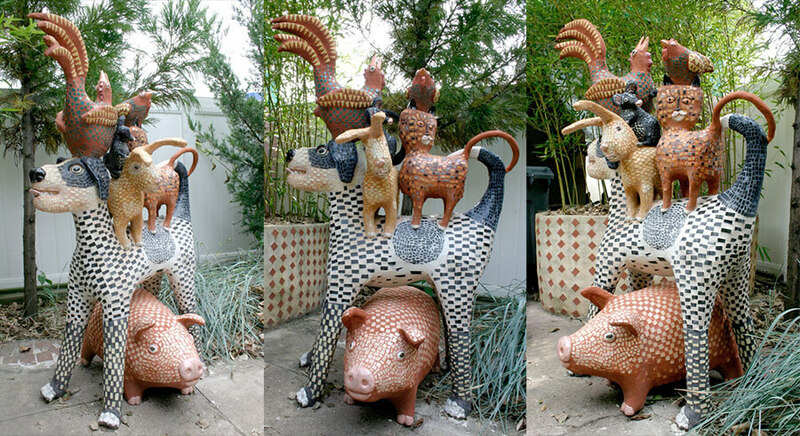 Peaceable Kingdom Mosaic Lawn Sculpture by artist Marilyn Keating. 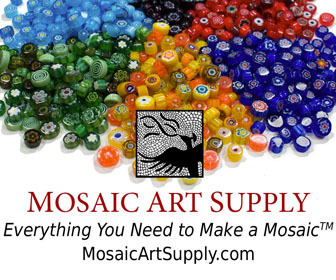 I have a page explaining how to make concrete sculptures for mosaic., but that page has an emphasis on using rebar and expanded metal for larger works. For smaller works, you can use non-structural materials like Styrofoam and wrap with a couple of layers of chicken wire. Then you put on multiple coats of thinset mortar to form a hard shell. Allow the thinset to harden for 48 hours between coats. 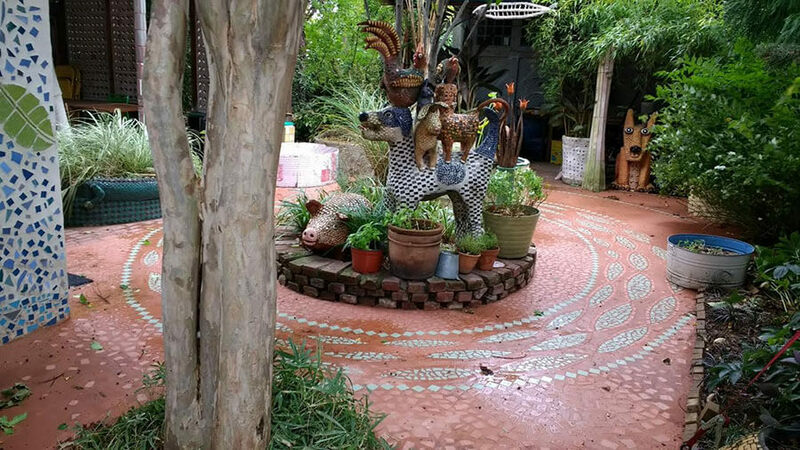 A Caveat: If you have a tiled object outdoors that looks sturdy like it is made from solid concrete, eventually someone might stand on it or do something that might damage it. Consider potential abuse situations over the years before deciding that the core of your sculpture can be hollow or non-load-bearing. The advantages of using light cores like Styrofoam and pink foam insulation board are several. First, the material is cheap, easy to find, and easy to cut. Second, a three-dimensional can be put together from flat layers and then sanded and shaped. Third, the finished sculpture will be much lighter. The lighter, non-structural materials can be used with load-bearing frames made from rebar or angle iron, and so you don’t have to completely disregard internal strength to take advantage of them. 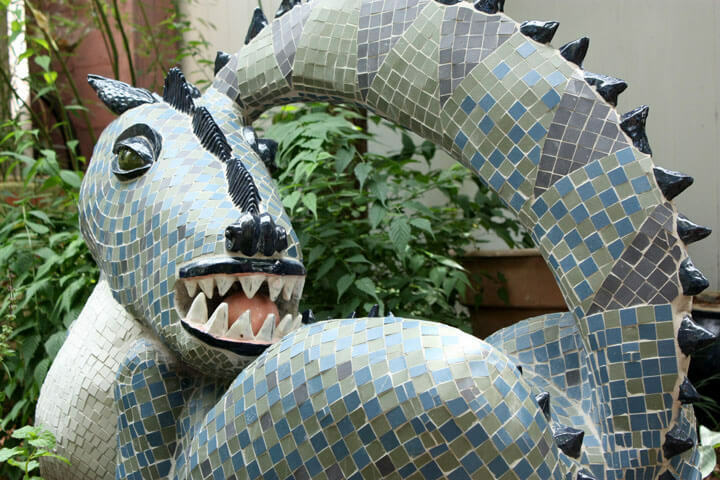 There are many ways to make a concrete sculpture for mosaic. Basically, you can use anything other than materials like wood, which expand and warp when exposed to humidity. 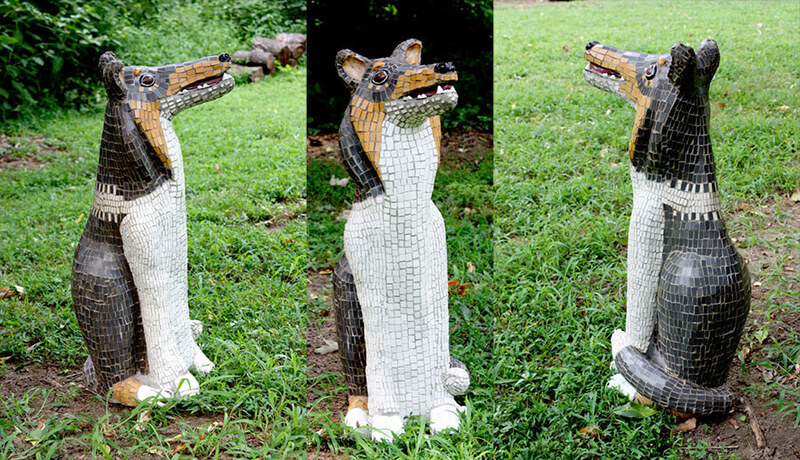 Ripley Mosaic Lawn Sculpture by artist Marilyn Keating. I’m a sculptor so I weld pencil rod or rebar together for big pieces. Often I just tie rods together with rebar wire. I laminate the forms from sheets of 2″ foam insulation boards (like pink foamular 250) that I cut to size with a bandsaw or a bread knife. I then carve them to a more finished shape with a bread knife and a corrugated shaper. I cover the foam with hardware cloth for more organic shapes. If shapes are more geometric I switch to stucco mesh. I tie the hardware cloth on with rebar wire and hog rings in whatever way works to get a tight fit. I like the barbed plastic fasteners that they use for that new stucco over foam construction method too. I haven’t found a fiberglass mesh to use for big pieces but drywall tape over foam works for small things. Then I rough coat with commercial sand mix or make my own with 1 part portland cement to 3 parts sand. Then the tile setting fun begins. I love custom building flex bond. It costs more but stays workable a long time and sticks to anything. I use a combination of handmade ceramic parts and mosaic. 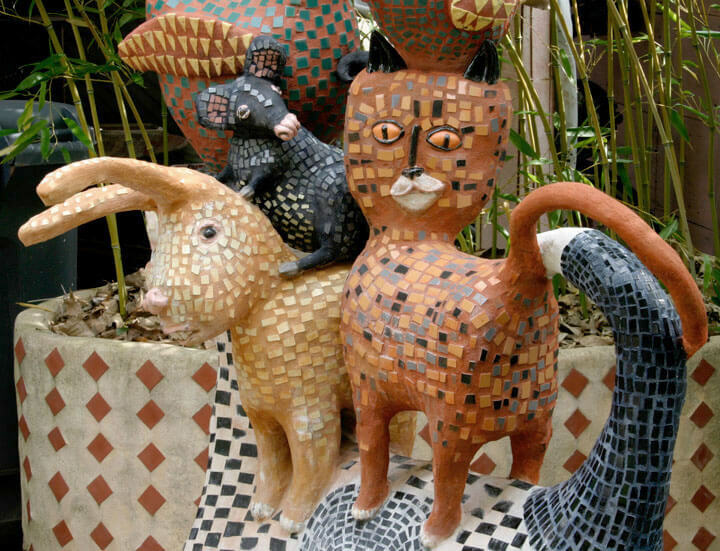 You can see more of Marilyn Keating’s mosaic sculptures and other artwork at her website. Fabulous!!! I am definitely saving this info. i just finished a class on making light weight concrete forms. This is great timing! Marilyn Keating’s sculptures are amazing. Love each and every one of them. Can anyone recommend a book on this, particularly what type of welding to learn. 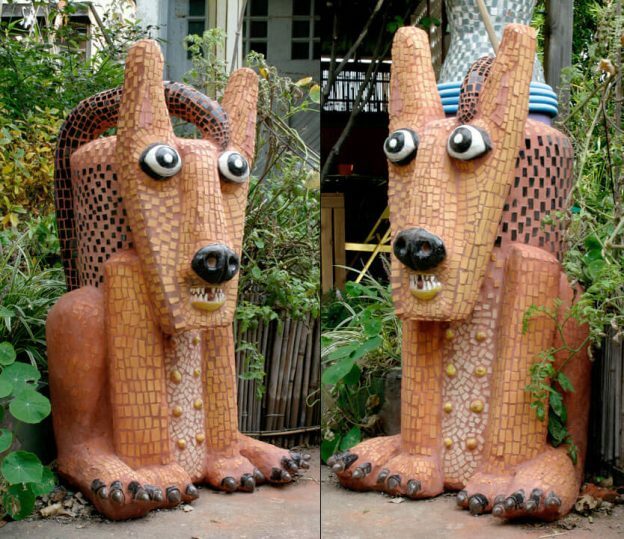 I want to try making a sculpture but am such a rookie, I’m not sure where to begin. Stick welding is fairly difficult for a novice, but wire welding is almost like a hot glue gun in terms of accessibility. Instead of a book, I would merely watch videos as needed for “wire welding” on Youtube. The only thing special is learning how to work with hot metal without burning yourself, but that isn’t hard for hands-on people.